← It’s all about the ingredients! Like many, the start of Day Light Savings signals to me that spring is coming. 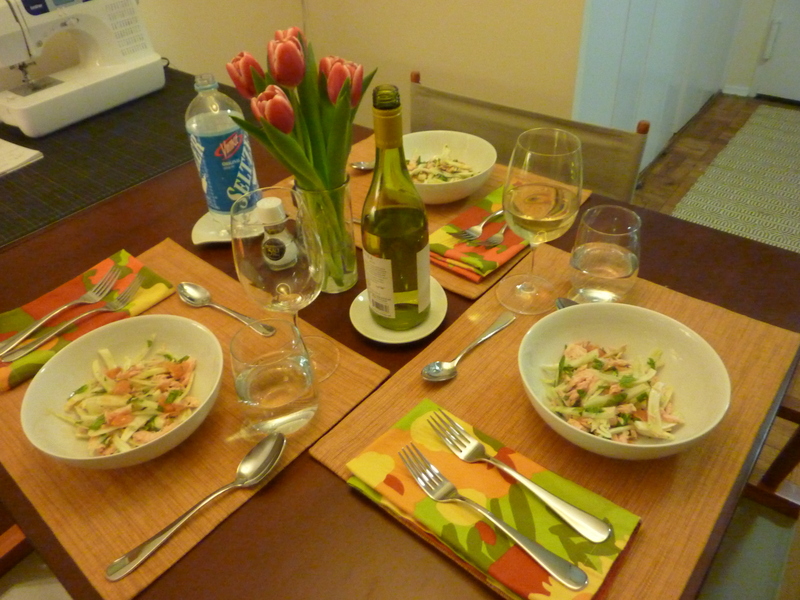 To celebrate the sun not setting until 7PM I held an “awaiting spring” dinner with two friends last night. Despite the chilly temperatures and cloudy day, I tried to make the menu feel very season-transitional. 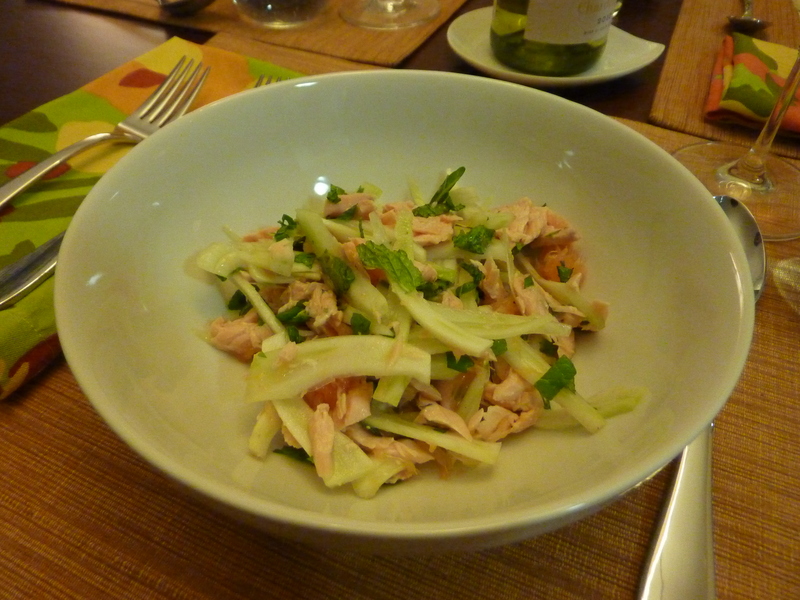 We started with an amazing salmon salad with fennel, orange and mint that I have made before. It is such a refreshing way to start a meal and provided a real transportation to the warm spring days ahead! Also, because it is a cold salad, it is easy to prep in advance and serve at your convenience. The only adaption that I made to the recipe was to use Cara Cara oranges (sometimes called “red navel”) instead of classic navel as the recipe calls for. I sprung for the Cara Cara at the recommend of Fresh Direct – of course! The flesh is a beautiful dark pink (like a grapefruit) and it’s juice is just a little sweeter with noticeably less acidity – which made it a great addition to the salad! The only downside of using the Cara Cara is that the sections aren’t as easy to cut out as a navel’s are. The second course looked back to the warming comfort foods of winter and was suggested by the lovely Nancy who found and recommended the Sweet Potato Gnocchi with Gouda Cheese Sauce recipe found on The Noshery. Although I originally intended on making the gnocchi myself as Nancy had done, when I realized I was trying to execute this dinner on a weeknight I relinquished and bought prepared Sweet Potato Gnocchi from The Amish Market for $3.98. New Yorkers are blessed to have high-quality freshly-made pastas very readily available, often at such a great price there is no reason to make your own! Although I am positive home-made gnocchi would have been more delicious, the Gouda sauce really is the stand out of this dish! The milk used in the sauce was flavored with garlic, onion and sage, which gives it a wonderful complexity when mixed with the smokiness of the Gouda. This photo is missing the sprinkle of nutmeg on top that was very important since the gnocchi themselves were missing that spice. Also please don’t skip the minced fresh sage garnish on top – it really pushes the dish right over the top! 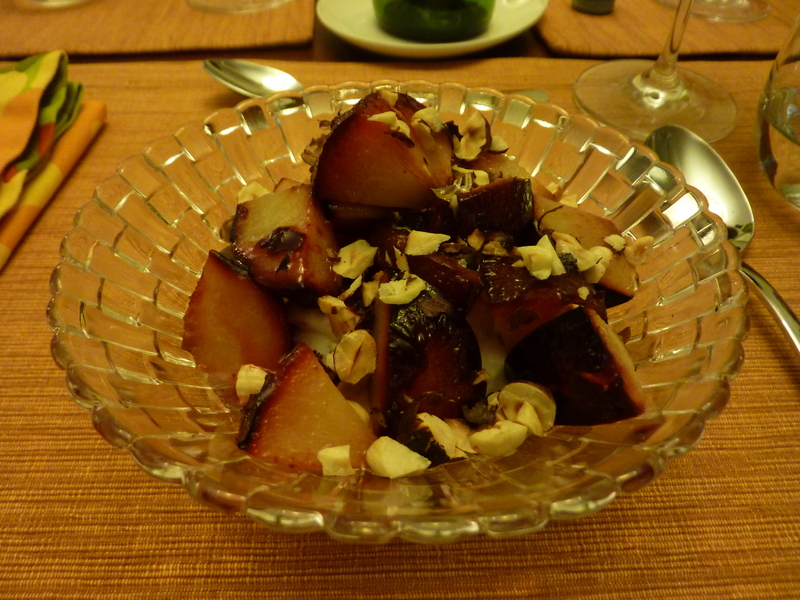 Lastly, we finished off the meal with my favorite non-indulgent dessert: Roasted Plums with Toasted Hazelnuts and Greek Yogurt. I love this dish becuase the flavor combination seriously tricks me in to thinking I’m eating something really rich! The plums are roasted in a small amount of butter and sugar and the final plate is drizzled with honey to keep the whole dish feeling sweet. Greek Yogurt serves as the perfect base (I use 2 Tbs Fage 0% at the bottom of each bowl) to give a creamy taste without melting like ice cream could. Finally the hazelnuts are what really keeps me coming back – something about their association with chocolate, the smell and taste of toasted hazelnuts just says “desert” in my mind, and taste buds! 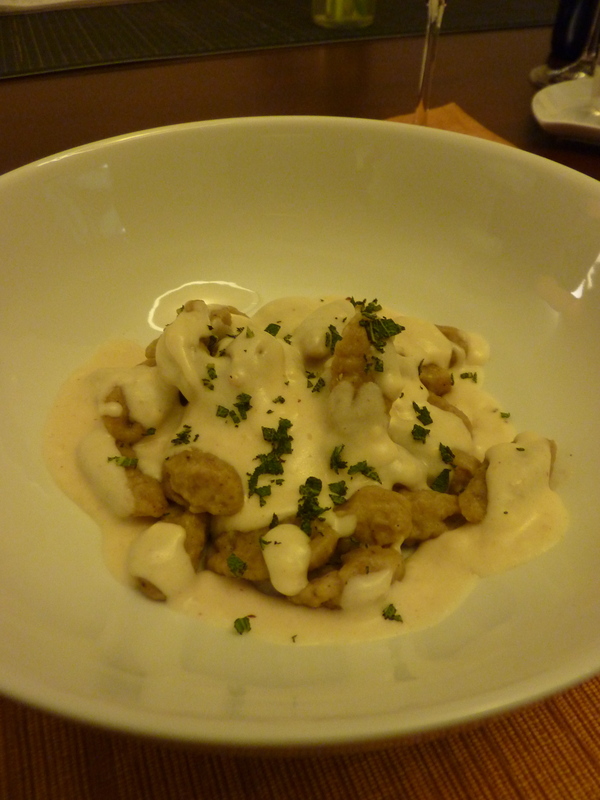 This entry was posted in Culinary Adventures, Entertaining and tagged Desert, Dinner Party, Easy Dinner, Entertaining, Gnocchi, recipe, Salmon. Bookmark the permalink.